This week, we’re chatting to Fabrice, a 54 year old Parisian. Having previously lived in London, he has now settled in America, where he has been living since 1998. As a keen traveller, Fabrice realises the importance of speaking a foreign language when attempting to discover another culture. Having tackled Spanish, Fabrice decided to challenge himself further by learning Chinese with Coffee Break. We began our chat by discussing Fabrice’s initial impressions of Coffee Break: “The reviews I read were really really good. It was also free – you can’t do worse than that! So, I started listening I think at the gym which was interesting because I’d tried podcasts walking my dog and at the gym before and it never really worked for me, I don’t know why. I think Coffee Break is more like a story. The way Mark explains things makes you listen. It’s not like some other podcasts that just throw a lot of stuff and then that’s it. Mark goes into a lot of detail in everything and that gets your attention, so it’s the only one I’ve been able to use at the gym”. 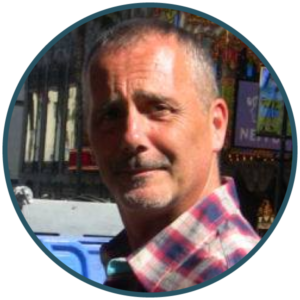 When Fabrice started learning Spanish with Coffee Break, he immediately clicked with the method of learning: “I loved the explanations from Mark. He was brilliant at explaining the subjunctive – I know he loves the subjunctive! Even though I’m French so I know what a subjunctive is, but the way he was explaining it was amazing! I loved the stories and how that worked. I was following the lessons almost everyday. Then I got a subscription to the premium version so that I could get the bonus materials, and then I continued with seasons 3 and 4. I’m still at season 4. I wouldn’t say I’m fluent, I’d never say I’m fluent but I’’m pretty good at Spanish now. I believe that Coffee Break Spanish was part of it”. With lots of Mexicans where he lives in San Diego, Fabrice decided that learning Spanish would be beneficial: “I thought you know I’m about 15km from the border, I like going there for dinner – it’s cool going to another country just for dinner! Then I wanted to be able to communicate with them, learn their language as when you start learning a language, you start learning the country that goes with it, so that was very important for me. Unfortunately Mexicans, especially Mexicans on the border, speak some kind of Spanglish! It’s hard to follow them, but now I’m able to have a conversation with them (and) I’m able to order food”. He recalls his trip to Uruguay after learning Spanish with Coffee Break for 8 months: “I dived in and hoped for the best – and it worked so well! Sometimes it was difficult, like every language when you start saying: Hablo un poquito, they’re like ‘Oh you can speak the language!’, so they start speaking to you in the language! So, I was very very happy with the results”. Encouraged by the success of his trip, Fabrice decided to push himself further by setting himself the goal of sitting the A2 exam: “I passed that then I worked towards the B1 exam. I went to Colombia to take it and I passed, so that gave me confidence. Afterwards I thought, you know what I really enjoy this, I could maybe learn another language, so then I looked at the possible languages”. After much contemplation, Fabrice decided to start learning Chinese. As Coffee Break Chinese didn’t exist when Fabrice began learning the language, he used other language-learning methods initially. However, when Coffee Break Chinese launched, Fabrice used the lessons as a way of reviewing and consolidating what he’d already learned. He told us all about his method of language learning: “I take one method for about 6 months, then I take another method and I start from the beginning. That gives me different perspectives on learning the language. All these methods are completely different, so it reinforces what I’ve already learned, but the information is a little bit different which is good for my brain…I continue in parallel with two methods so I’ve got 6 months, and 6 months, and then I have a third one and then a fourth one…. I’ve got four methods on the go at the same time. I always start from the beginning, (of any course) that’s how I work….I get a really good foundation with this method”. Fabrice found the Coffee Break Chinese lessons very user friendly: “When I started Coffee Break Chinese I was very happy to see there were videos, especially with the use of the characters. This time Mark was not a teacher, he was a student so I was wondering if it was going to be slower or faster. The first lessons were obviously very easy for me as I’m a bit more advanced, but hearing Mark struggling with some things reminded me (of myself) struggling on the exact same things. So again I felt that connection which is very important. Another thing about the way I learn is that I need someone to tell me what to do. There is another podcast which I know of, but there is no structure which makes it difficult for me to know where to begin. That’s what I like with Coffee Break, there’s a structure, you’re going from A to B. So, that’s what I do with Coffee Break Chinese. I start with the video then I look at the notes then I go to the bonus material. I sit looking at the notes and then I listen to the video, but then I walk back and forth because it’s too easy to be in front of the computer and pause. I force myself to get that answer as fast as I can. I use Coffee Break Chinese slightly differently to how I used Coffee Break Spanish (which I used at the gym). I really have to concentrate when I’m learning Chinese. Whereas I’m much more confident with Spanish. When I get to intermediate level with Chinese I’ll probably do the same thing, listen at the gym”. 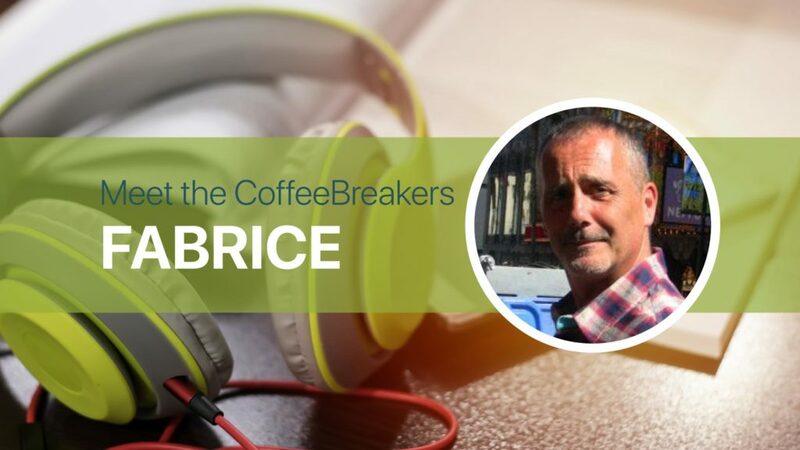 Fabrice attributes the success of Coffee Break to the length of the lessons: “A Coffee Break lesson is about 20 mins or 30 mins and then the bonus materials last about 15 minutes – this is perfect timing. I can’t go beyond 30 minutes. I also like the fact that there’s a break and then 15 more minutes. I really like that timing. I wouldn’t want to have more than that”. He recalls a memorable experience: “When I went to San Diego to get my Chinese visa, the guy was not even looking at me and then, I don’t remember what I said but it was a very small sentence in Chinese, and his face suddenly lit up and he said ‘Oh you know a little bit of Chinese?’ and I said ‘I’m learning, I want to visit your country!’ He was very impressed. Speaking another language really does make a big difference for people”. PrevPreviousCBG 2.40 | Wie wäre es mit Donnerstagabend?